Funding of almost €43,000 for a Cycling Officer for the Dublin City Council area was included last night as part of the council’s budget. The city’s previous Cycling Officer, Ciaran Fallon, left the position after there was uncertainty over the on-going funding of the position. After the Department of the Environment stopped funding the position in 2011, cycling campaigners managed to get the funding extended for 6 months, but no longer. The new funding will cover up to the next city council budget. Councillors can’t direct the city manager or chief executive to employ people, but last night’s motion was a “strong encouragement.” The Cycling Officer recruitment should take around 6 months, with the funding set to cover June-December of next year. The funding comes under a deal between the Greens, Sinn Fein, Labour and most independent councillors which see a business rates (tax) deduction limited at half a percentage, rather than the 1% reduction suggested by council officials. The deal also includes: €500,000 on cleaning public areas, €400,000 on footpath repairs, €400,000 for the city’s area offices to spend, €200,000 on 1916 centenary events, €100,000 on special projects at the city library and archives service, and nearly €57,400 on a planning officer. Cllr Cuffe added: “I’m looking forward to working with the new Officer to push through some priority projects, and making sure that Dublin’s authorities think of cycling and cyclists just as much as they think of cars, buses and trains. If we’re going to keep attracting people to bike for their daily commute we’re going to have to accelerate the pace of reform and put in the new cycle lanes, locking facilities we need, and improve the dangerous roads we already have. I am particularly keen on getting more children taking up cycling. “Improving our cycling infrastructure is a win-win for the city, and I’m delighted that Greens on the Council have secured a Cycling Officer for the exciting years ahead,” he said. The position was a recommendation of the 2009 National Cycle Policy Framework. 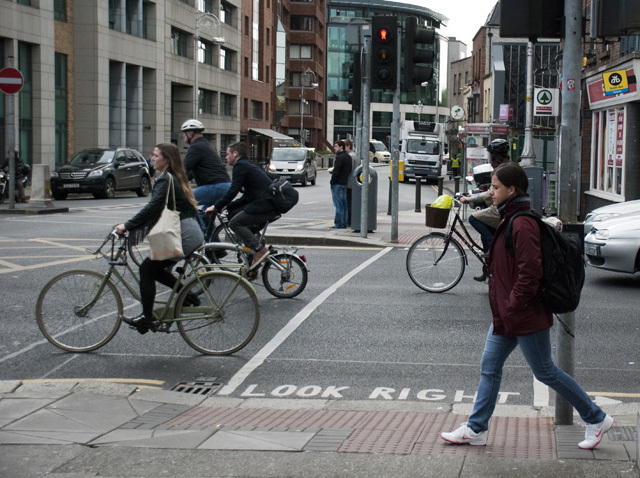 Will be critical for further promotion and rollout of cycling in Dublin, but criteria for post will also be critical. It needs to have a broad brief and powers to ensure strong working relationships with all City departments!